The course I designed most recently, “Global Indigenous Struggles since 1900,” surveys indigenous experiences from around the world. (To view a recent syllabus for this course, click here: Syllabus_Global_Indigenous_Struggles_Since_1900_SP2015). 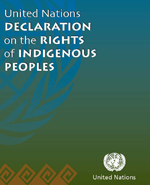 Course content anchors to the development of a global indigenous rights consciousness and the legal regime for protecting Native peoples, ensconced in the 2007 UN Declaration on the Rights of Indigenous Peoples, over the course of the twentieth century. Each week we identify a lens of historical inquiry—like gender, labor, or environment—and apply it to a specific Native community, thereby uncovering the lived experiences of the globe’s Native peoples. Lectures offer background information and commentary on the benefits of and challenges to historical analysis, while exercises with primary source evidence offer students the chance to apply historical methods to their thinking and writing. Discussions are a forum through which students can add their own thoughts, experiences, and disciplinary methods to the content at hand. The two assignments and exams in Global Indigenous Struggles are designed to maximize my ability to assess student performance over the semester. The first is a short review of the film Rabbit Proof Fence, which tells the story of three Aboriginal girls who ran away from an Australian boarding school in the 1930s. The goal of this assignment is to spur critical thought about the film, get students to develop a thesis, and to organize a coherent argument. It also provides an early opportunity to gauge strengths and weaknesses in individual and group writing skills. Throughout the semester, I hold writing workshops and pass out resources, all aimed at remedying these target areas. The midterm exam is a long-form, hand-written essay question, given weeks in advance. This way, students have time to consider evidence (drawn from lectures and readings), take a position, and organize their responses—thereby reinforcing student skills. By the time they encounter our final project, the class has two assignments under their belts, each of which informs their ability to succeed at the last. The final project is an online exhibit, in which each student selects an indigenous community or issue from anywhere in the world and writes a short, primary source-based essay on that topic. (Click here for an example from the Fall 2014 section of my class.) Students peer-review one anothers’ drafts, then submit them and receive feedback before turning in their final essay. Posting this assignment online raises the stakes for many students, leading them to think, write, and edit more carefully than they might on a conventional paper, which students often turn in and forget. As a whole, the exhibit becomes a publicly-available repository on generally understudied peoples. But it also gives students a tangible example of their work to which they can refer in interviews or applications for years.